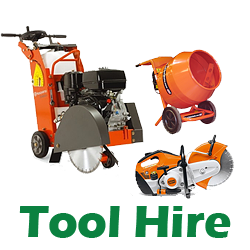 cutting of asphalt or concrete with an outstanding cutting performance. 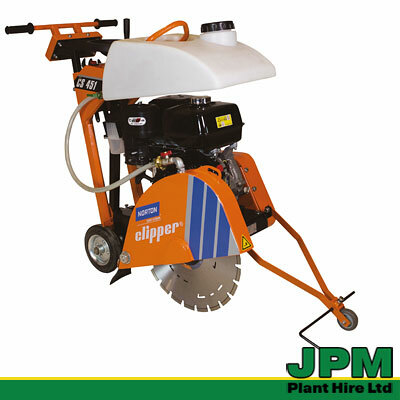 It offers excellent visibility of the cutting operation and easy handling, which is obtained by the optimal weight distribution and the positioning of the 25 litre water tank, which adds weight onto the blade.Two cutting guides attached to the blade cover reinforce both performance and visibility. By means of a hand-wheel the operator can adjust cutting depth, indicated by a gauge. The ergonomic handle is adjustable to operator’s height and stays level at any cutting depth, whilst vibration absorbers improve working conditions. The rigid frame is also designed to reduce vibrations for better comfort and to make the CS 451 robust. Pulleys with removable hub and Poly-V belts allow easy maintenance and reliability of CS 451. The best performance is obtained with genuine NORTON CLIPPER dry or wet cutting diamond blade. 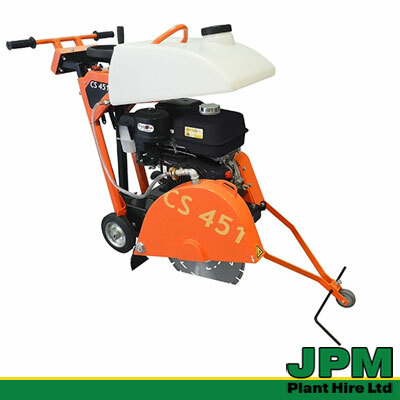 At JPM Plant Hire we offer an extensive range of tools and equipment for hire. All of our floor saws are maintained and serviced to the highest standards with the intention of providing quality, dependable hire equipment. We will gladly offer professional advice on choosing the right floor saw or road saw for your requirements, confirm the hire cost for the hire period, our terms and conditions and what is is included in our hire arrangements.